The Rift Walker was everything I expected it to be and more! I don't even know where to begin to put into words just how much I truly love this series. Clay & Susan Griffith are one heck of a team. They have created a world and story that you will be talking about for weeks. The first in the series took me by surprise, especially since I am not a huge Sci/fi fan, and now The Rift Walker has done it again. I am killing my brain here trying to figure out exactly what to say. More than half of this book left me with my mouth open and with butterflies in my stomach. One minute you are lost in a world of war & politics, and the next you are sucked into an epic romance. The way Greyfair loves Adele will touch your heart in ways you never thought possible. He would give up everything he is and everything he has ever known just to be with her, and Adele the same for him. Together, they are an amazing team. They felt that as long as they have each other they could conquer it all. I was easily pulled into their story and while reading it, I felt like I was standing on the sidelines just watching everything play out. Adele is such a powerful and smart character you can't help but love her. She has a strong mind and thinks of others first. She isn't selfish and knows what is best for her people. And even when facing the worse situation ever, she never backed down. She knew what was expected of her and wasn't afraid to do what needed to be done. You will just have to read the story to understand what I mean. I love this series and I HIGHLY recommend it. Even if you aren't into Sci/Fi, I promise you will love it. 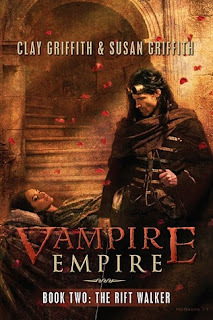 There isn't one person I know who read the first in the series, Vampire Empire: The Greyfair, and did not love it. It's unpredictable with moments that will leave you with your mouth hanging wide open. There wasn't a moment for me to take a break because so much was happening in each chapter that I just did not want to stop reading. "We have weathered crisis after crisis and we're still together. If all we have are these brief moments together, I would be content." Adele embraced him. "I would too." "We will find a way to make you empress and return you to your home," he said quietly. She caressed his face with her hand and turned him to look at her, to see her steadfast conviction matched his own. "I am home." 5 out of 5 stars!!!!!!!!!! I agree, loved The Rift Walker. This has become one of my favorite series and I'm not a huge epic story fan. Nice review! Not reading your review, yet, but I just wanted to see how many stars you gave it. And yay! 5/5! I would expect nothing less from the fabulous Griffith duo. Hoping to start this one today! I'm not a huge sci-fi fan for books either, but this is a series that I really want to read! Book Sake, I will admit that the first book was a little hard to get through the first couple of chapters, but once GReyfrair enters the picture its just ... Sigh... pure love! I love this series so much! And the second one is a lot more love involved. I've been really interested in this series for some time now. It sounds absolutely fantastic and right up my ally. On my TBR shelf! sigh..I can't wait. I love the Greyfriar. I agree with you about not really into sci-fi. I had never read steampunk before either but this is a great series. I'm so so glad that I decided to read the first book. It was absolutely wonderful. I'm dying to read more about them two. Thanks for sharing your review. Your review was great, I can't wait to read this series, it sounds so fantastic. This series sounds so good! Thanks so much for your review, which made me want to read it even more!! Sounds like a great series... will definitely have to add to the wishlist! Great review too! I wanted to hug the book when I was done reading it. I can't wait for The Rift Walker. Haven't read this yet, but sounds like a great series. Love the premise. Ty for sharing the great review! Ooh this is so exciting to hear. Loved the first one and can't wait for this one! I'm new to the series. Sounds amazing though. I love sci-fi and steampunk, so I'm already intrigued lol. Loved the teaser!! Oh man, yes- now I'm dying to read it! The teaser definitely has me more excited too. I'm so glad that I don't have to wait through the whole book for them to just be together in the very end or something.